Haemophilia should be suspected in those presenting with excessive bleeding after injury or surgery, easy bruisability in early childhood and spontaneous haemorrhages. The age of presentation and the severity of symptoms depend on the severity of deficiency of coagulation factor. The disease is graded according to the percentage of coagulation factor in blood in comparison to normal population. 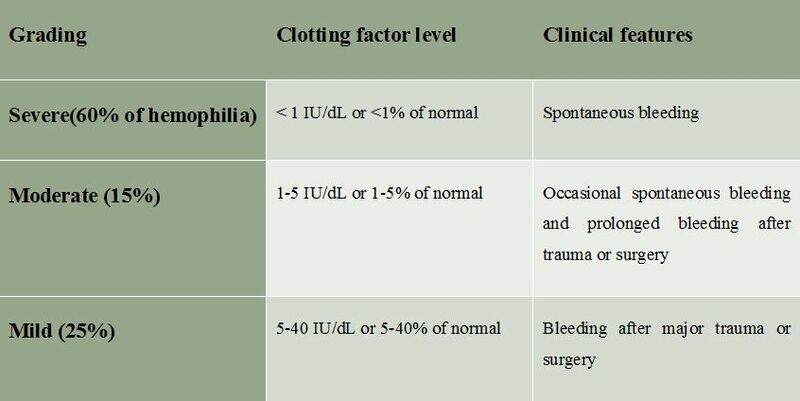 Age of presentation depends on the severity of clotting factor deficiency. Severe deficiency presents in infancy due to spontaneous hemorrhage. Mild deficiency may present as uncontrolled bleeding after dental extraction or injury. Most frequent site of bleeding is intraarticular. Haemarthrosis may be acute, subacute or chronic. Acute haemarthrosis presents with severe pain and tense joint effusion. Subacute haemarthrosis presents with mild pain and thickened synovium with restricted range of motion. Chronic haemarthrosis presents with stiff and deformed joint with enlarged epiphysis. Intraarticular bleeding can progress through the stages of chronic synovitis, inflammatory arthritis or progressive arthropathy. Inflammatory synovitis can lead to synovial proliferation and pannus formation leading to articular cartilage destruction. Hyperemia produced by inflammatory synovitis can lead to enlargement of epiphysis and limb length discrepancy. Weight bearing joints are most frequently affected. Most common joint affected is knee followed by elbow and ankle. Tense intramuscular bleeds may lead to compartment syndrome. Intramuscular bleed most commonly seen in the quadriceps, gastrosoleus, deltoid or the volar compartment muscles of forearm. Intramuscular hematoma can lead to nerve palsies. Soft tissue bleeding usually seen over the forehead, olecranon bursa or prepatellar bursa. Haemophilic pseudotumour is a condition where a progressive cystic swelling develops due to uncontrolled bleeding into the soft tissues leading to pressure necrosis and erosion of surrounding tissues. Most pseudotumours are produced by subperiosteal bleeding leading to extensive periosteal stripping and necrosis of overlying muscles. Pseudotumours are most often seen in the thigh followed by pelvis and abdomen. It should not be mistaken for malignancy and should not be aspirated or biopsied. Findings on imaging depend on the duration and the severity and stage of disease. Initially imaging shows soft tissue swelling. But in advanced stages, the imaging shows soft tissue swelling, narrowing of joint space, erosion of articular surface, osteoporosis and hypertrophy of epiphysis, osteophytes, subchondral cysts and the joint deformities. Screening is done by doing bleeding time, platelet count, clotting time, prothrombin time and activated partial thromboplastin time (APTT). In haemophilia, the prothrombin time, bleeding time and platelet count will be normal and the APTT will be prolonged. Appropriate factor replacement therapy needs identification of the deficient factor. Factor assay is needed for confirmation of diagnosis and for monitoring treatment. The sample should be collected in citrate tubes containing aqueous trisodium citrate dihydrate, Testing should be done within 4 hours. Treatment requires a multidisciplinary team in setup with facilities for care of haemophiliacs. Facility for factor VIII and IX assay and for detection of antibodies should be available. Aim of treatment is to control bleeding during the acute phase and to prevent or reduce the number of bleeding episodes by factor replacement therapy. Acute bleeding should ideally be treated within 2 hours if possible. Factor replacement can be done by whole blood, frozen plasma, cryoprecipitate, viral inactivated plasma derived factor or recombinant factor. Recombinant factor is preferred to avoid the risk of disease transmission. Two major approaches to treatment are prophylaxis or episodic treatment. Those with severe disease will need regular factor VIII replacement therapy as prophylaxis to prevent spontaneous bleeds. Milder forms of disease is treated by treatment during the episodes. Prophylactic treatment has been found to reduce the incidence of arthropathy, life threatening bleeding and other complications when compared to episodic treatment. Prophylaxis if started within 2 years of age has been shown to prevent arthropathy. Prophylactic treatment is given one of the 2 protocols. Malmo protocol: 25–40 IU per kg per dose 3 times weekly in haemophilia A and 2 times a week for haemophilia B.
Utrecht protocol: 15–30 IU per kg per dose 3 times a week for haemophilia A, and twice a week for those with haemophilia B. In the episodic method of treatment, patient is treated by factor replacement therapy during an episode of bleeding. Factor VIII concentrates are the treatment of choice in haemophilia A. Factor VIII concentrates are available from 250-5000 IU per vial. In the absence of inhibitors, each IU of factor VIII per kg given will increase the plasma level by 2 IU/dL. The dosage required is calculated to raise the factor levels to 30% of normal. In severe bleeds, dosage is aimed at raising factor levels to 40% of normal. Factor VIII is injected intravenously at a slow rate not exceeding 3ml per minute in adults and not more than 100 IU per minute in children. Factor VIII level should be measured 15 minutes after the administration. In haemophilia B the treatment of choice is factor IX concentrates. Each IU per kg of factor IX will increase the plasma level by 1 IU/dL. Recombinant factor IX will increase plasma level at a lower rate; each IU/kg increases plasma level by 0.8 IU/dL in adults and 0.7 IU/dL in children below the age of 15 years. To calculate the dose, multiply the body weight by the level desired. 50kg man with a desired level of 40% will need 50X40 = 2000 IU of factor XI. For recombinant factor IX formula is body weight X level desired multiplied by 1.25 in adults and multiplied by 1.43 in children below 15 years of age. Fresh frozen plasma or cryoprecipitate can be used if factor concentrates are not available in spite of the risk of disease transmission. Each ml of fresh frozen plasma contains 1 IU of factor VIII. As it is difficult to achieve factor VIII level of more than 30 IU and factor IX levels of more than 25 IU with FFP alone, the acceptable starting dose is 15-20ml of FFP per kg of body weight. Each bag of cryoprecipitate prepared from one unit of FFP contains 70-80 IU of factor activity. With widespread availability of clotting factor replacement therapy most patients now have almost normal lifespan and haemophilic arthropathy have become the most important cause of morbidity. Arthropathy is due to intra-articular bleeding which leads to intra-articular accumulation of iron as hemosiderin leading to inflammatory synovitis, articular surface destruction and deformity. For the prevention of further joint destruction either surgical or radioisotope synoviectomy may be needed. DDAVP (desmopressin acetate) a synthetic vasopressin derivative is the treatment of choice in mild or moderate haemophilia A if the patient has been found to be responsive. As there are wide individual variations in the response to desmopressin, the response should be tested in each patient. It is useful only in haemophilia A and acts by elevating the factor VIII levels 3-6 times the basal levels. Dosage is 0.3 microgram per kg body weight, either by intravenous or subcutaneous route. Intravenous infusion is given in 50-100ml normal saline over 30 minutes. Response to intranasal route is more variable. Intranasal dose is 1.5mg single metered dose into each nostril in those over 40 kg body weight and into one nostril in those with <40kg body weight. It may produce water retention and hyponatremia due to it’s antidiuretic action. Antifibrinolytic agents such as tranexamic acid or epsilon aminocaproic acid may be used in patients with haemophilia to stabilize the clots or before minor procedures. It is useful in control of bleeding from skin and mucosal surfaces. Orthopaedic surgery may be needed for arthropathy or after trauma. Preoperatively the inhibitor screening should be done. Adequate clotting factor supply should be available. If not adequate blood and plasma should be made available. Dosage and duration of factor replacement therapy depends on the type of procedure done. In acute haemarthrosis the following steps are taken for treatment. Correct anaemia and hypotension if present by blood transfusion. Administer appropriate dose of factor as described earlier. If not responding repeat half of the initial dose at 12 hours in haemophilia A and at 24 hours in haemophilia B. If persistent after 72 hours rule out presence of inhibitors, septic arthritis and fracture. Arthrocentesis may be done with maintenance of at least 30-50 IU of factor activity for 72 hours if there is unrelieved severe pain, neurovascular compromise or suspicion of sepsis. Gene therapy is the future of treatment. Genes could be delivered through a viral particle, delivery through stem cells or by in vivo genomic editing. Nathwani et al in 2011 described injection of a viral vector carrying the gene into the liver of 6 patients with haemophilia B leading to significant improvement in the factor VIII levels in all patients. Liver transplantation is curative. Marilyn J. Manco-Johnson et al. Prophylaxis versus Episodic Treatment to Prevent Joint Disease in Boys with Severe Hemophilia. NEJM 357;6, 2007.